Rainbow Falls is one of the most unique in the Great Smoky Mountains. 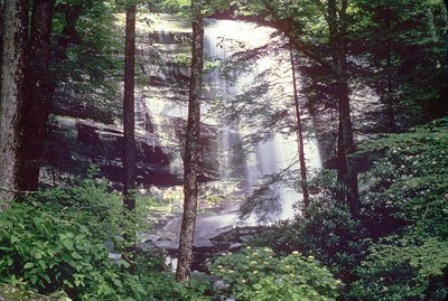 It's main features are LeConte Creek cascading down the mountain and picnic areas along the trail. Located on the Roaring Fork Motor Trail in Gatlinburg, these falls get their name from the rainbows that appear when the sun glistens on the water at the base at just the right time. In winter, there's a transformation into an ice formation which turns it into a winter wonderland when it's cold. Rainbow Falls is the perfect place to enjoy the mountains! The area is filled with ample areas to get plenty of relaxation and spend time with someone special, or enjoy a picnic with friends, or family. As you hike along LeConte Creek Valley, you'll come along a foot-bridge a little over 1.5 miles down the trail. There will be another one just as you arrive at the waterfall. This 80-foot waterfall is the Great Smoky Mountain's highest single drop falls! 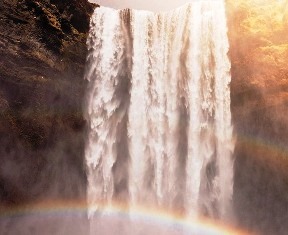 The best time to hike Rainbow Falls is early in the morning, or later in the afternoon to see the rainbow. This happens only when the sun is shining directly over the falls. They are the most beautiful after a heavy rain, however, hiking can be more dangerous due to slippery algae. The Great Smoky Mountains National Park requests that rocks in the area must NOT be climbed upon for any reason! It's very dangerous! People have been killed, and severely injured as a result of their climb. If you're interested in hiking to the Smokies' third highest mountain, Mt. LeConte, you may continue hiking another 4.2 miles to reach the top! In Gatlinburg, come to Red Light #8. Turn onto the Historic Nature Trail/Airport Road. Go about a seventh of a mile and turn right onto Cherokee Orchard Road. Drive into the National Park and keep driving until you come to the one-way Cherokee Orchard Loop Road. Drive about 0.6 miles. The Rainbow Falls Trail-head is located on the right. There are two parking lots. If the first lot is filled, drive about a 10th of a mile and you should be able to find parking there.